A great addition to the product kitty of Zaclon India Ltd.Excellent LED Head Lamp on Helmet - rechargeable type - A GREAT SAFETY DEVICE. 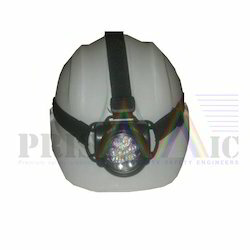 - Helmet with lamp bracket and head lamp with battery(9 V) which can be recharged. The Fenix HL50 LED Headlamp has so many features you are looking for. We like to call this our "Dual Headlamp." It takes dual power sources (CR123A or AA batteries) and it also has a removable head that allows you to operate it as a hand-held or keychain flashlight when desired. - ECO-MODE: a consistent luminous flux for a continuous operating time of many days.